FETID ZOMBIE “Decade of Death” compilation CD/Book, celebrating 10 years of underground death metal, is now available from Toge No Jizo (Japan). The CD features select tracks from the FETID ZOMBIE discography as well as a 184-page A5-size book featuring unpublished sketches and other artwork related to the band. For customers outside of Asia, copies will be available from the FETID ZOMBIE Bandcamp website and Riddickart webstore this winter. 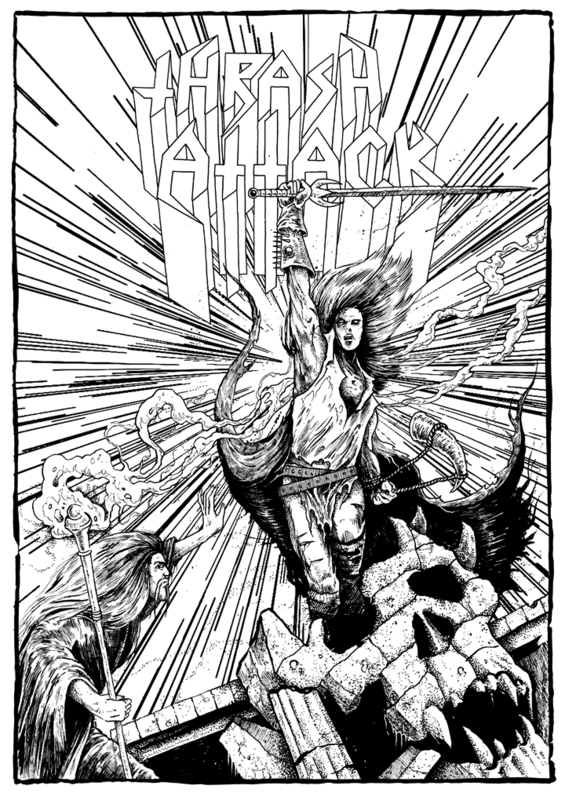 THRASH ATTACK Magazine (Germany) Issue 11 cover art. The illustration is based on the characters from the old CIRITH UNGOL (Michael Whelan) and ASHBURY (Ernie Polo) covers. The magazine features interviews with both bands as well as others like ETERNAL CHAMPION, RIPPER, etc.